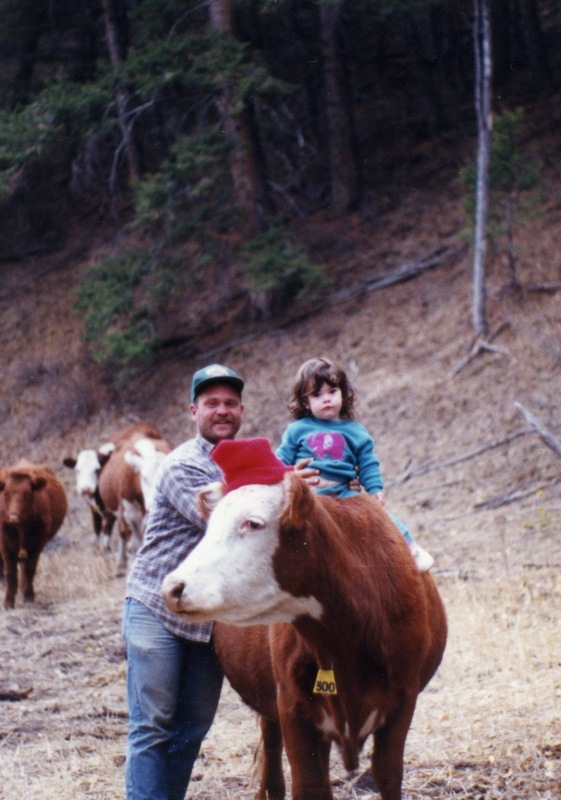 During the past 45 years of raising cattle, we’ve found that certain animals in our herd stood out in some unique way and will always be remembered. 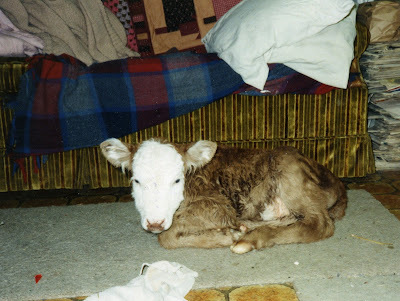 One cow that actually became part of our family began life as an unusual, tiny little heifer that very nearly didn’t survive her birth. We were calving out 33 heifers that January (1994), and half of them had calved by January 10, with no problems. Then Bohemian Barby went into labor. She was a daughter of Yugoslavian Yentl and a granddaughter of German Ginger and great-granddaughter of Swiss Miss—and niece to French Francis, African Annie, Mexican Muchacha, Danish Duchess, Kenyan Kizzie, and a bunch of other "country girls." Yes, all our cows have names! We put Barby in the barn about noon that day, when we noticed that she was calving, and by 1:30 the amnion sac was emerging, along with part of the placenta. This signaled a problem; if the placenta was already detaching, the calf was in trouble. So we put a halter on Barby and tied her to the side of the stall to restrain her so we could check her. My husband Lynn reached into the birth canal and uterus and felt two very tiny feet, very limp and unmoving. This seemed to be a premature calf being aborted, except that Barby was on schedule according to her breeding date. The calf was so tiny it was easy to pull out, and when it plopped out onto the straw we thought it was dead. The placenta immediately came out, right after the calf, and half of it was rotten. Perhaps there were originally twins; Lynn felt an odd mass in the uterus when he first reached in to check Barby—maybe there’d been a twin that died early on and mummified. That might be a clue to why part of the placenta was no longer viable. right after we carried her into the house after she was born. Anyway, we thought this calf was dead, until it wiggled its head. The tiny critter was alive! So we quickly helped it start breathing, and our daughter Andrea ran to the house to get some towels to dry the calf. The temperature was cold that day, even in the barn. Barby started licking her baby and would have mothered it nicely, but the calf was so tiny and frail we were afraid it would have trouble getting up to nurse. And the longer it stayed in the cold barn, the more chance it would soon have pneumonia. 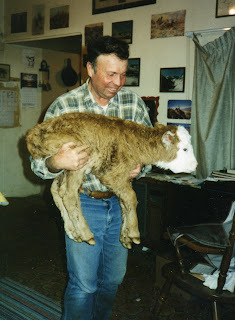 So Lynn carried the calf into the house, and we continued drying her by the woodstove in the kitchen. Out of curiosity, we also weighed her. She weighed only 34 pounds—compared with 70 to 80 pounds for a normal heifer calf at birth. The heifer was tiny, but she had a big attitude. She was soon on her feet and trying to walk around the house. I thawed some frozen colostrum—we always milked some every year from a few gentle cows, to freeze for emergencies—and fed the calf with a bottle, then fixed a place for her in a cardboard box. She was so small she was able to live in a toilet paper box that was 14 by 24 inches. She stayed in that for a few days until someone was able to take the time to drive to town and bring home a big freezer box. 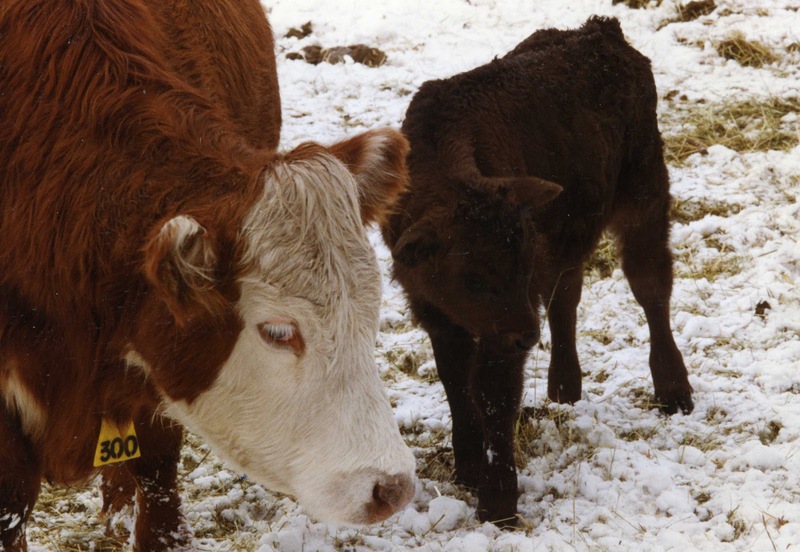 The calf lived in that cut-down freezer box for 4 weeks. We used towels for bedding and changed them a couple of times a day. She peed them regularly but only pooped once every 24 hours, usually during the early night shift, when our daughter Andrea and son-in-law Jim were checking the cows and giving the tiny calf her midnight bottle. She was so small we were giving her a pint bottle every 4 hours. Andrea would clean up the mess (guys seem to have a weak stomach for these sorts of things) and feed her, then Jim would let the calf out of the box to gallop around the back room for exercise. The calf was full of energy and loved her racing time. 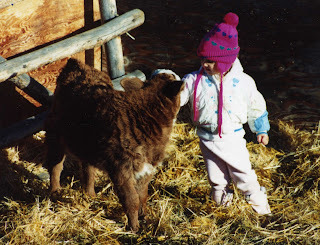 Lynn and I were supposedly asleep at that time of night, so I could get up at 2 or 3 a.m. to take over the early morning calving shift, but I could often hear the clatter of little hoofs as Smidgeon (the first name we gave her) raced around the back room. She always wanted to charge out into the main dining room area, but Jim kept her in the back room. 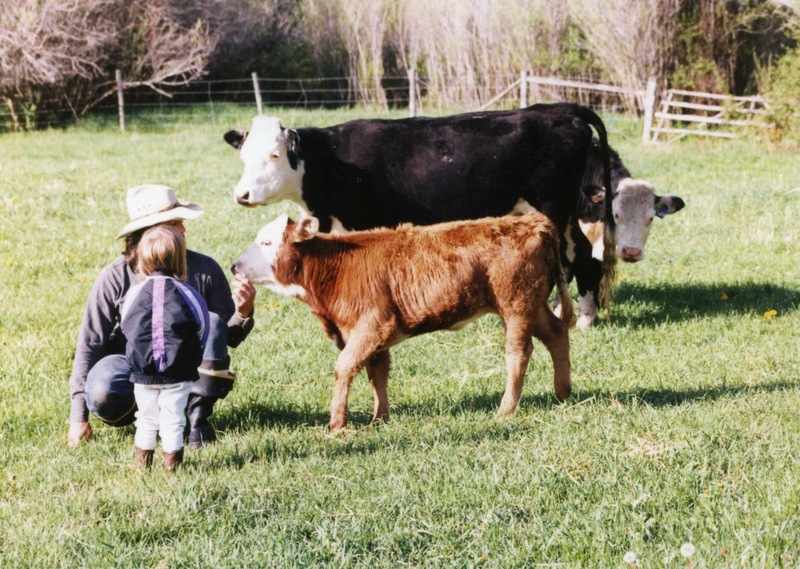 He was usually sitting in the doorway on a stool, reading a book between cow checks, and would stick out his leg to stop her—and the calf would try to jump over his leg. They had fun together and were soon best friends. Her first name just didn't fit, so Jim named her Norman—like the calf in the Western movie comedy City Slickers. We were very busy during the rest of calving season, and Norman didn't get out of her box very much except during Jim's shift. But she entertained herself by chewing on her towels and shaking them, like a dog would. Even after she was living outside, she loved to chew on cloth—and would grab a person’s sleeve or pants leg in her mouth. Norman was finally able to live outside after she was a month old (and had grown from 34 pounds to 70). Another first-calf heifer, Margot, had lost her three-week-old calf to an acute gut infection; he was in deep in shock and unconscious by the time we found him, and though we treated him in the house for several hours and tried to give him IVs, we could not save him. Margot needed a calf, so this was a chance to give Norman a real mother. little Heather, is getting acquainted with Norman. with Jim and young Heather. Margot wasn't happy with the idea, but she didn't protest much. We put hobbles on her hind legs to keep her from kicking Norman, and let them be together in a small pen. Norman was so excited to have room to run. She was more interested in zooming around the pen than in her new mother; we had to teach her to nurse the cow. Margot finally accepted the substitute child, but Norman was always independent. She never did consider herself a bovine. She'd rather associate with people. She was so independent that Margot had trouble keeping track of her, so we didn't turn them out on the range that summer. They lived in a pasture at home, with two old cows and their calves. Norman grew, but her legs didn't. She was a deep, long, big-bodied heifer with short legs, and we called her our dachshund cow. Everyone who came to visit us, including our son’s two small children, liked to pet Norman. our son's small children, liked to pet Norman. 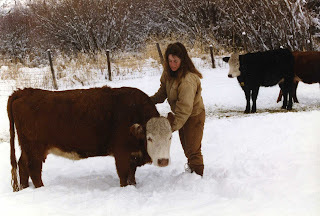 We usually gave Jim and Andrea a "bonus" heifer every year for all their good help, to add to their growing herd of cows, and Andrea always selected one of the best heifers in the herd. But when we offered Jim his pick, he wanted Norman. We teased him about it at first, because she was such an odd heifer with her short legs. We would never have chosen her to keep as a cow. 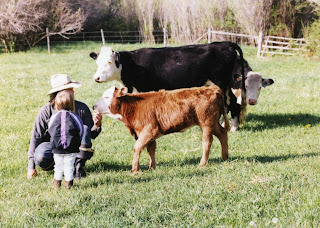 But Jim was serious; he liked the feisty little heifer and had faith in her potential. 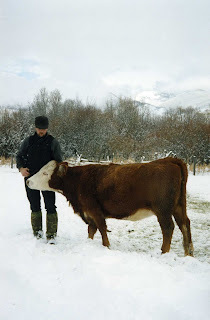 So Norman stayed on the ranch and lived with the replacement heifers that winter—and went to the range the next spring. We weren't sure how she'd do on the range (being a spoiled pasture baby), and we weren't even sure she'd been bred. We have breeding dates on most of our heifers, but we hadn't seen Norman bred. She did fine on the range, however, though she always expected us to get off our horses and scratch her under the chin whenever we saw her during our range rides. Jim worried about Norman when her time came to calve (yes, she was pregnant), and though she calved on my shift (7 a.m., January 16, six days after her second birthday), we had to get Jim up to be present at the birth (he'd made us promise!) because he was so concerned about her. But she had her calf okay—a nice little black bull calf that Jim named Harley—and Norman mothered the baby just fine. 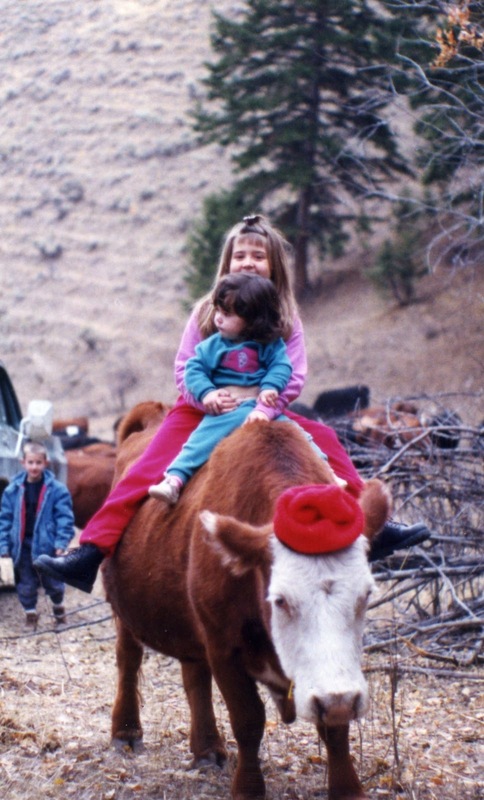 Her experience as a "people cow" had not dulled her motherly instincts. Harley grew to be a big calf, nearly as tall as his short-legged mama by the time he was sold with the other calves in the fall. Norman had vindicated Jim's faith in her as a good cow. 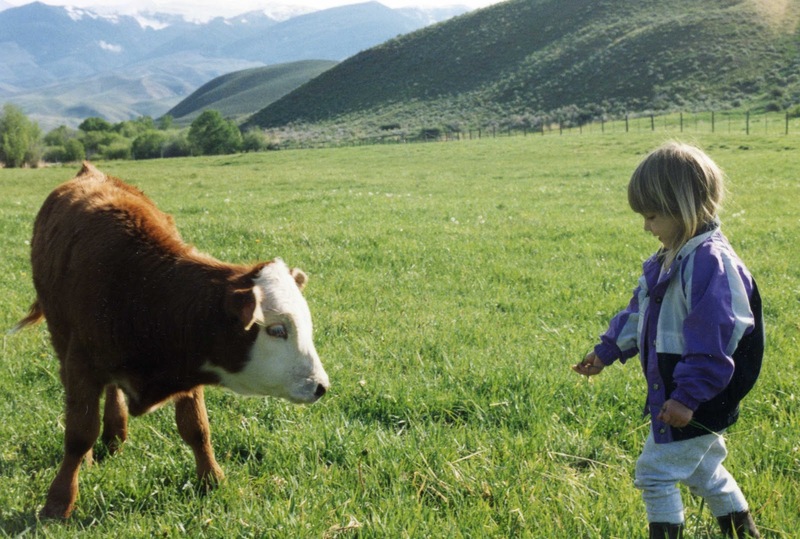 Her second calf—an even bigger steer named Chief—was as tall as his mama at weaning time. 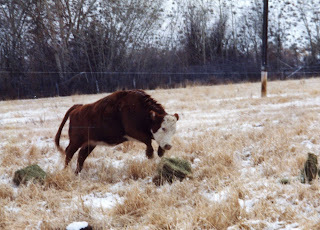 She had many more bull calves (and only two heifers) and stayed in the herd until she was eleven years old. She was everyone's pet—and loved to have her ears scratched. She tolerated the grandkids fussing over her and even riding her! Though she was a sassy clown, she was gentle with the kids. Her final summer on the ranch, she babysat a young bull we bought and helped gentle him. After the breeding season he was not happy living by himself in a corral and was too nervous and grumpy. We didn't want him to have to compete with the older bulls, so he lived at pasture with Norman as a companion and was quite content. Norman was a sassy clown . . .
Norman was special even though she was a funny-looking cow. We all loved her, and she expected us to. If there were any people around, she wanted to be scratched, especially on her neck and behind her ears, and she'd wiggle her ears with delight. She didn't mind having children—or even big people—sit on her back.
. . . but she was always gentle with the kids. 1 1/2-year-old niece Emily ride Norman. All of our grandkids "rode" her one fall day in 1999 when the family was up on our high pasture cutting firewood. Norman came sauntering up to the pickup to socialize, and the kids took turns riding her. In the years after that, some of the grandkids climbed onto her back on other occasions. one fall day in 1999. She demanded our attention and enjoyed being fussed over, but she always loved Jim the best. I guess she knew she belonged to him, or maybe it was the other way around.